Federal High Court Abuja on Monday heard how ex-Chief of Air Staff (COAS), Mohammed Dikko Umar, allegedly splashed N2.38 billion on five choice houses in Abuja, Kano and Kaduna. The court was also told that Umar, who was COAS between October 2010 and September 2012, directed the payment of N558.2million to himself monthly as upkeep allowances outside his legitimate earnings as an officer of the Nigerian Air Force (NAF). A former Director of Finance and Accounts at NAF Headquarters, Abuja, Air Commodore Salisu Abdullahi Yushau (retd. ), who disclosed this, said he believed that the funds Umar deployed to acquiring the five houses were from the N558.2m he got monthly. Yushau, who gave details of how the houses were bought by Umar, using different names, spoke as the first prosecution witness at the trial of Umar, who is facing a seven-count charge of money laundering. Umar, in the charge filed by the Economic and Financial Crimes Commission (EFCC), is accused of diverting United States dollars’ equivalent of N4.8b. Led in evidence by lead prosecution lawyer Sylvanus Tahir, Yushau, who said he participated in the purchase of the houses upon instructions from Umar, said the former COAS spent about N140m to renovate two of the houses. Dressed in white native attire like Umar, who sat directly opposite him at the other end of the courtroom, Yushau, who said Umar facilitated his appointment as the Director of Finance and Account, testified for about two and half hours. As the witness spoke, Umar, who kept a straight face, occasionally stared at him, particularly when he (the witness) tried to describe all that transpired. Throughout his testimony, Yushau kept referring to the defendant as “my boss, the then Chief of Air Staff”. Tahir insisted that he (Yushau) refer to Umar as the defendant to avoid ambiguity in identification. The witness said although he had indicated his intention to quit, Umar, who was so impressed with his performance, insisted that he served his (Umar’s) successor, Air Chief Marshal Alex Badeh. The witness said: “NAF was receiving about N4b monthly (a little above N4b, about N4.1b). However, the actual figure that we usually paid as salaries monthly was between N2.3 to N2.4b. The balance of about N1.6b was made. “From this N1.6b, the sum of N558,200,000 was usually set aside for the upkeep of the Chief of Air Staff. The sum of N120m was also earmarked for the office of the Director of Finance and Accounts. But on assumption, I told the Chief of Air Staff that my office did not require that amount of money. “So, the sum of N120m was put under the Chief of Air Staff’s office, which he was using for visits to NAF formations and other welfare issues. The balance of about N1b was used for training, maintenance of NAF assets, fleet, and other priority projects. These projects included barracks construction, renovation of barracks accommodation for officers and men, and any other projects that the Chief of Air Staff may wish to undertake. “This sum of N558,200,000 was usually converted to USD and taken to him at home. The money was usually brought to me by the Finance Officer, Headquarters NAF Camp, Group Captain Bukar. “On some occasions, I asked the Finance Officer to accompany me to his (COAS’) official residence at Niger Barracks, so that he could witness the delivery of the money to the Chief of Air Staff. This practice lasted up till his retirement in Sept. 2012. “I believe he was using the money for whatever he wanted to do. However, there were some properties which he purchased and I believe the money could be from the money we usually gave to him,” the witness said. On how the houses were purchased, Yushau said: “Sometime between November 2010 and January 2011, my boss, the Chief of Air Staff, the defendant, called me and asked me to get somebody, who could find a house for him around Maitama, where he intended to settle down after his retirement. “I got a brother of mine, Barrister Husseini Umar, of Capital Law Firm, and told him what my boss wanted. After a couple of days, he came back to me and told me he had found a house at Vistula Close, off Panama Street Abuja. I went and inspected the place with him, and I informed the defendant that the lawyer had located a very nice house. “It was a five-bedroom duplex, with a guest’s chalet, a swimming pool and two-bedroom boys’ quarter attached to the house. My boss, the defendant, asked me to arrange for inspection. Barrister Husseini Umar gave us a time in the evening and I went and picked the defendant. We went to the property where we met Barrister Umar in the evening. Because there was no light, I went with a torchlight. “The defendant saw the house and was happy with it and gave the go-ahead to Barrister Umar to negotiate the purchase of the house. The price of the house was then agreed at N700m. The defendant authorised the purchase and asked me to take the money from the money we normally give to him monthly. And I then directed the Finance Officer at the Hqts, Group Captain Bukar, to give the lawyer the equivalent of N700m which was given to the lawyer in USD. “The defendant gave me the name on which the deed of assignment should be prepared. That name was Mohammed Maijamaa. I gave the name to Barrister Umar. After they completed the documentation of the purchase, the deed of assignment and power of attorney were brought to me for onward transmission to the defendant,” Yushau said. On the second house, he said the defendant called him sometime in early 2012 and told him to get him another property in Asokoro, because he (Umar) was tired of living in Maitama. 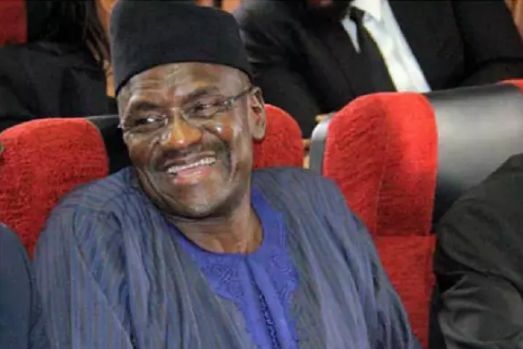 He said through the efforts of Barrister Umar, a property at Plot 1853 Deng Xiao Ping Street, off Mahima Mohammed Street Asokoro was secured for the defendant, which he bought at N850m. “This is a property of duplex of about 6 bedrooms, an underground hall, BQ, a gym, swimming pool, and two-bed room guest’s chalet. Just like the previous house at Maitama, he also gave me the same name, Mohammed Maijamaa, for the preparation of the power of attorney and deed of assignment. “Thereafter, Barrister Umar brought the title deed, the power of attorney and deed of assignment to me for onward transmission to my boss the defendant. After that, he said he wanted a mosque to be constructed, the fence to be redesigned, and the swimming pool to reduce the depth because of children. “So one Architect Saka was invited to carry out the job. The price was agreed at N66m and my boss, the defendant, gave the go-ahead for the payment to be effected. That was the end of that transaction,” he said. “On the third house, the witness said the defendant, sometime in 2011, directed him to scout for a house for him to buy in Kano, so that when he visits his home state, as the COAS, he will not need to rent accommodation. “So, I went to Kano, and through a friend by name, Jubril Shuaibu Ala, we got an agent who helped us scout for a house. That was how House No 14 Audu Bako Way, Kano was purchased. The house was a seven- bedroom duplex with an enclosed swimming pool, about three living rooms, a study, a lawn tennis court, and a squash court and also I think a two-bedroom boy’s quarters. “The house belonged to one Sudanese by name Mustapha. I inspected the House, and came back to Abuja to brief my boss, the defendant. During our next visit to Kano, we went with him to the house at night. He (Umar) inspected the house and met the owner and had some discussions with him. “Subsequently, the amount was agreed at N250m. The defendant, after returning to Abuja, gave me the money to pay in USD. I called Jubril Shuaibu Ala, who facilitated the transaction, to come to Abuja and collect the money. “I gave him the amount as agreed in USD. And he went and effected the payment. I cannot remember the actual name he gave for the preparation of the title deeds, but all the documents were given to me and I handed over to the defendant,” the witness said. Yushau said he also assisted Umar to buy No 8, Kabala Road, Kaduna from a former Commandant of the Armed Forces Command and Staff College, Jaji, Air Vice Marshal Sunday Ali Leks. He said the last house was the one the defendant bought at Plot 3B, Street 2, Ministers Hill, Mabushi, Abuja at N500m. The witness said he got the house from a colleague, Group Captain Bukar, which he later gave the defendant to occupy when he was to vacate his official residence and his Asokoro house was not ready. “At that time, we could not get any property that we could let for one year. So, I remembered this house at Mabushi. I met my boss, the defendant, and asked him if they could manage that place at Mabushi. I explained to him how I came about the place. “He told me to tell my wife to pick his wife and show her the place. His wife was happy with the place when she saw it. That was how they moved into the house to enable the new Chief of Air Staff move into the official residence. They were living there up to the time I was retired on 31/12/13. “Sometime early 2014, he told me that it was time for them to give me my house but I felt there was no way I could move into a house that was occupied by a former Chief of Air Staff. I told his brother, Abdullahi Mahmoud Gaya now a House of Representatives member, that there was no way I was going to stay in the house. So if they move I would have to sell the place. “He (Gaya) went and discussed with his brother, my boss the defendant. And sequel to their discussion, it was agreed that my boss, the defendant. should pay me N500m for the house. I told Bukar of the development and gave him the reason for taking the decision. “I subsequently collected from my boss the USD equivalent of N500m from his house, and I used part of the money to repurchase my No 8, Embu Street, Wuse 2 from Bukar, who was at that time in the UK. That was how the transaction ended,” Yushau said. When Yushau ended his testimony, defence lawyer Hassan Liman (SAN) sought a short adjournment for him to cross-examine the witness. Tahir did not oppose this. Justice Nmandi Dimgba adjourned the hearing till February 16 for continuation of trial. - People were just sharing Nigeria's commonwealth anyhow, anyhow. Na wao!